The Amazon Fire Stick is an amazing device. Television services are moving away from cable and satellite and are moving toward internet based streaming formats. I simply love it!!! If you’re looking for scaled-down Fire TV functionality in a wonderfully mobile format, Fire TV Stick is the obvious solution. Back in late 2014, the first generation Fire TV Stick came to market and it’s now been discontinued. Today, we’ll be exploring the second generation model which burst on the scene in October 2016 and is still going great guns. With a brand new version of 4K-enabled Fire TV now available, Amazon have dropped the price of the miniature Stick so it now costs little more than a round of drinks. First thing’s first, setting up Fire TV Stick couldn’t be easier. It really is pretty much a case of plug and play. Pop your Fire TV Stick into an HDMI slot in your TV or receiver. If the recessed design on your television is problematic, simply use the provided adapter. The micro USB cable just connects to a power source and you’re almost ready to roll. Unless you buy Fire TV Stick from a third party source, you’ll find that your account details are already in place. All that remains is to input your WiFi password and rack up the remote. Amazingly, for devices like this, batteries are actually included. We’d strongly recommend sitting through the instructive intro video which will walk you through the rudiments of voice control. While an Amazon account is a prerequisite, you won’t be forced into Prime membership. As we’ll outline later, though, this really is worthwhile if you want to extract the best from Fire Stick TV. If, however, you don’t want the recurring cost of a membership, you can sidestep this by purchasing content or avail yourself of a streaming app like Netflix or hulu. Although you’ll need to enter usernames and passwords for any apps, circumvent the fiddly tedium of using the clunky on-screen keyboard by downloading the Fire TV remote app and using your cell phone or tablet keyboard instead. Measuring up at a skimpy 3.4 x 1.1 x 0.5 inches, this revamped Fire TV Stick is a little bulkier than the original but it’s still a highly portable piece of kit. Given that this device is designed to be tucked out of sight in your TV’s HDMI port, it’s understandable that there’s little but stripped down simplicity to look at. The voice remote looks the same as the controller bundled with the first generation Fire TV Stick. Measuring just under 6 inches, this simple black control has a circular navigation button at the top which you can click in the center to confirm your actions. 6 playback buttons sit below while the microphone button is above with a pinhole mic up top. Fire TV Stick is not going to carry off any prizes at a design award ceremony but it’s more than fit for purpose. The thing that counts with any media device is raw performance and Fire TV Stick delivers in fine style. Although the processor is not quite as brisk at the 1.5GHz of Fire TV, the quad core ARM 1.3GHz is pretty rapid. The HEVC codec is supported. There’s only half the RAM of Fire TV with 1GB. Amazon claim a speed increase of 30% over the first generation Fire TV Stick. The main difference is with launch times although browsing is also slightly faster. We have to agree that it’s a definite improvement but, if you have the earlier version, it’s not noticeable enough that you should feel compelled to rush out and instantly upgrade for reasons of speed alone. Storage could be better at 8GB but you can always avail yourself of free cloud storage to circumvent this skimpy allowance. WiFi has been ramped up from 802.11n on the original to 802.11ac on this rebooted model. While the WiFi is strong and stable, since you won’t be able to press an Ethernet connection into commission, there’s no 4K video support. On the upside, you won’t be restricted to placing the device near a router either. Running on Amazon’s pared-down variant of Android, user-friendliness is uppermost. While you won’t get Google Play, you can access a more limited strand of Amazon’s App Store in its place. The crisp and oversized icons are a breeze to navigate and ideal if you’re less than tech-savvy. Since games call for superior processing to streaming, this is one area where it’s seriously worthwhile investing in the new version of Fire TV Stick. You’ll notice an enhanced frame rate and response time along with sharper graphics. You can use the remote to play games or hook up a Bluetooth controller if required. There’s also a better selection of games on the all-new TV Stick. Although you won’t get HDR or 4K-capability, the playback and picture quality is nothing to be sneezed at. All the performance in the world is nothing unless you have the content to match so how does Fire TV Stick score there? Using the nimble WiFi and Alexa voice remote – more on that shortly – you’ll be streaming in a flash with this nifty device. With half a million movies and TV shows at your instant disposal, never again will you be cursing that there’s nothing to watch. Whether it’s the usual suspects like Netflix and YouTube, hard-hitters like HBO and Showtime or Amazon video, imagination is your only limitation. Not everyone will be satisfied with the base offering of content so there are plenty of subscription services to further broaden the scope of your viewing and listening pleasure. If you enjoy streaming music, there’s a wealth of choice from staples like Spotify and Prime Music through to more esoteric radio stations. There truly is something for all tastes. Our main advice with content is to be prepared for the absence of Amazon’s direct competitors like Vudu and Google Play and to check carefully for what is free and what needs paying for so you don’t end up with any unexpected billing surprises. When Bill Gates said that content was king, he could very easily have been describing Fire TV Stick. It really is that good. 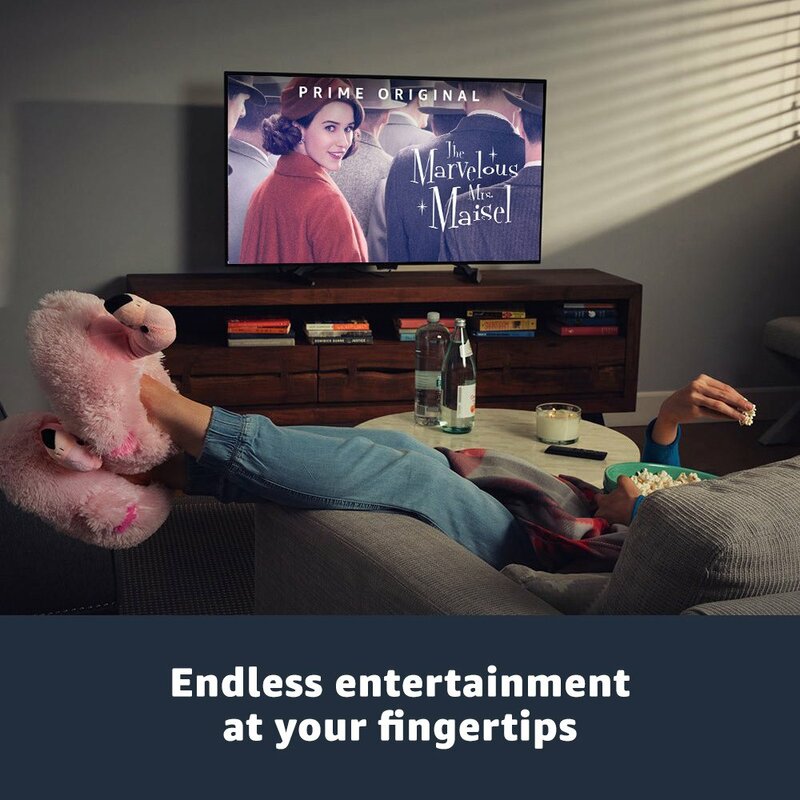 Amazon Prime membership comes at a very reasonable cost and it’s worth the nominal monthly investment if you want to max out the capability of Fire TV Stick and reduce ongoing costs of paying for content piecemeal. Although Prime content dominates the menu, you’ll certainly be able to search for free alternatives but, in our opinion, if you don’t fancy the idea of Prime, you might be better served by an alternative streaming device such as a Chromecast. Prime is affordable, straightforward and quibble-free to cancel and you’ll get a ramped up selection without needing to keep dipping into your pocket. You’ll find it represents money saved in the long run and you’ll also get a much wider choice. The ease of cancellation also means you won’t end up committed to a long period of a channel you might tire of. Alexa Voice Remote adds a new layer of convenience to navigation. All you need to do is hold the mic button on the top and the inbuilt microphone allows you to bark whatever commands you want so Alexa can serve your needs. Alongside simply searching for a movie or TV show, you can also put Alexa through her paces and dig in by genre, actor, director or theme. The broader and vaguer your search, the less accurate the results. When focused on reasonable requests, search is accurate and quickfire. 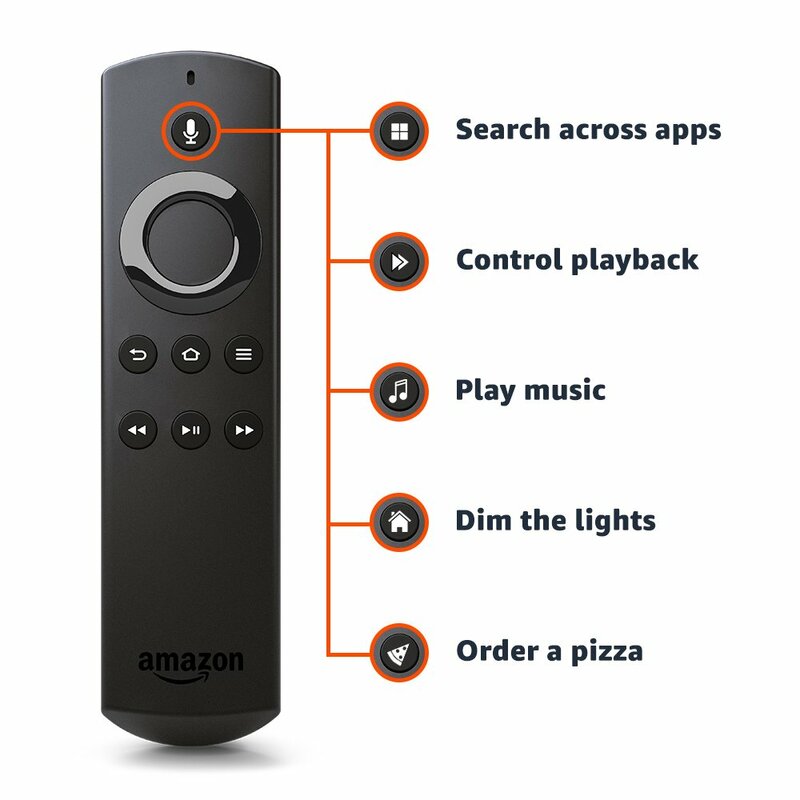 Since Fire TV Stick is hooked up to your TV unlike the Echo speaker, you’ll also get visual cues, known as Cards, to accompany voice search. These cards are not interactive and are nothing worth raving about. Although there are occasional omissions like Spotify, search with Alexa spans across nearly 100 apps and services. Whether it’s using Wikipedia, searching for a movie or ordering a pizza, Alexa reliably comes up with the goods. We would have to say that Alexa is the icing on the cake rather than a prime driver for purchasing Fire TV Stick but it’s certainly a lovely addition to a basic streaming device. If you already have Amazon Echo, pairing Fire TV with your speaker is a cinch. Make certain that both devices are linked to the same Amazon account before anything else. The moment you speak, they will pair automatically and you’re away. Connectivity doesn’t get much easier than that. 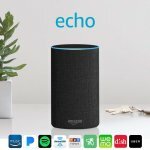 Amazon presents a handy, bite-sized guide to Alexa here and you can see at a glance all supported devices as well as a comprehensive list of commands. If you’ve never experienced a digital assistant before, it’s worth taking a few minutes to browse this document. More and more people are choosing to implement a range of smart home devices now and you’ll be able to control these using Alexa. 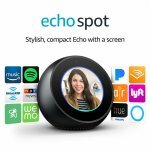 Sure, you won’t get the full hands-free voice activation you’d enjoy with Echo but pressing down a button is hardly taxing stuff. From your lights and locks through to thermostats and blinds, this is a neat add-on for any smart home owner. 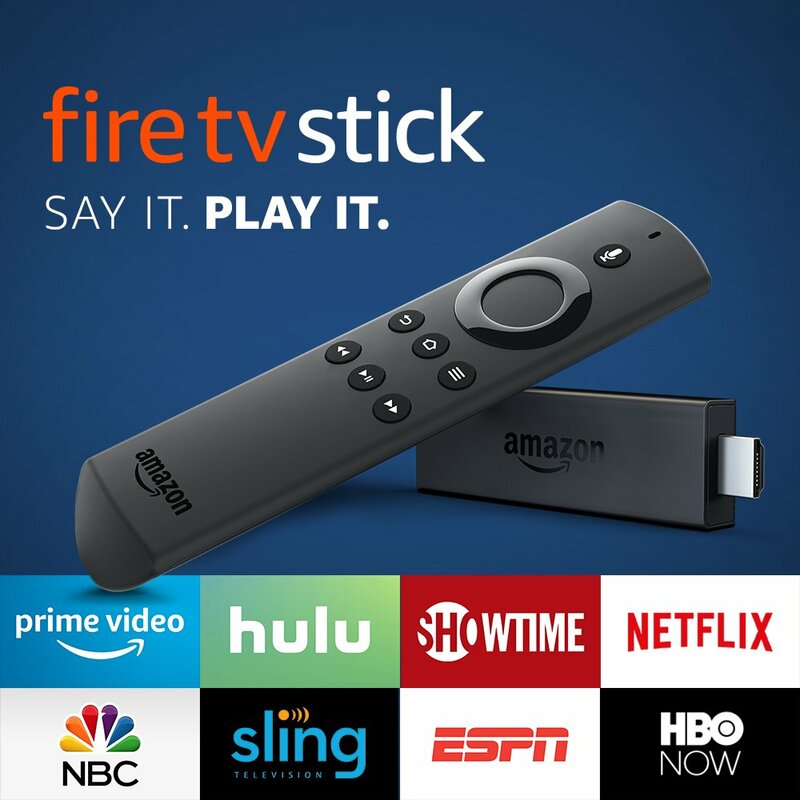 If you want a very portable and versatile streaming device without spending a fortune, Amazon Fire TV Stick is one of the smartest choices you could make. We’ll be the first to admit there are more powerful and higher performing set-top media streamers up for grabs. Comparing Fire TV Stick with 4K Fire TV is like pitting an iPad against a MacBook. Not everyone has the same needs, though. If you want a simple, effective and extremely cheap streaming device, you really can’t go wrong with this twist on a classic. While the improvements on Fire TV Stick might be subtle in this new incarnation, they are worthwhile tweaks nevertheless. Priced similarly to Chromecast and Roku Express, you’ll get the advantage of a mic-packing remote and all that Alexa offers. As far as budget streaming devices are concerned, Amazon Fire TV Stick carries the crown for us. This second generation dongle is a prime example of a great product that just got even better. All-New Kindle Oasis Review: It’s Back and This Time It’s Waterproof! 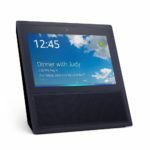 Amazon Echo Show Review: Love It or Hate It?